Locally produced loose artist canvas & imported loose linen, as either oil, acrylic, clear or un-primed, is available from Winsen’s Canvases in various widths. Locally loomed Natural Cotton Duck is available as 1.8 or 3 meter wide rolls. Synthetic Polyester Cloth is also available as 2.15 or 3 meter wide rolls. Both qualities can be obtained as Acrylic Gesso primed, per linear meter, or to the artist’s size specifications. In this regard, the cloth is pre-stretched and double-primed in 5 meter lengths – the maximum trimmed roll size is therefore 2.8 x 5 meters. Once stretched and primed, the canvas is trimmed, rolled onto a cylindrical tube, and wrapped for transportation. Loose canvas finds application to those artists wanting the flexibility in size; unencumbered by the borders of a set-sized canvas, loose canvas can typically be pinned against a backing board, allowing the free-flow of work to canvas edges. Once the artwork is complete, we can stretch the loose canvas onto a stretcher frame, against designated crop marks. Both loose canvas qualities are also available in their raw un-primed state, which are used for a variety of different applications. The maximum roll length in this regard is typically 50 meters. Loose canvas has also found application as back-drops, as a support substrate for lining canvas, or covering articles of various form. Imported Belgian Linens are available as 10 x 2 meter wide rolls. As with the local qualities, the linen can be obtained on per running meter rate or cut to the artist’s size specifications. Linens are available as Oil, Universal or clear/glue primed. Un-primed linen has also found use in a number of applications. 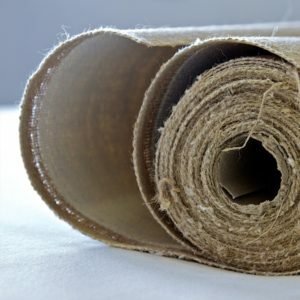 Given the beautiful and distinctive colour of un-primed linen, this material can be used in covering forms of various shapes, or backdrops to framed artworks. As with local cloths, once the artwork is complete, we can stretch the loose canvas onto a stretcher frame, according to the artist’s cropmarks.